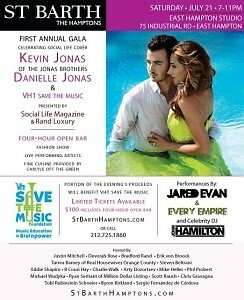 Social Life Magazine & Rand Luxury invite you to the first annual gala celebrating the Social Life Cover with Kevin Jonas of The Jonas Brothers and Danielle Jonas. Portions of the evenings proceeds will go to VH1 Save The Music. -Four Hour Open Bar -Fashion Show -Fine Cuisine provided by Carlyle Off The Green -Live performances by Jared Evan, Every Empire, and celebrity DJ John Hamilton. Limited Tickets Available: $100 ticket included four-hour open bar. Proudly sponsored by Belvedere Vodka.